Mortars are amongst the most versatile materials used in modern construction. They serve to lay bricks and other masonry blocks, coat buildings as renders and skim coats, fix tiles and smooth out floors. More and more, premixed (factory-made) drymix mortars are conquering this market and replace the traditional method of mixing cement and sand on-site by hand. Many different types of drymix mortars are available to contractors and specifiers in almost all Nations of the Middle East. The building levels in the urban agglomerations are advanced and the expectations of the end-users are high throughout the area. However, the fierce competition amongst the construction companies has led to an extreme pressure on the prices for all construction materials. And, as a consequence of this situation, some suppliers to the building industry reduce their product performance to increase their market share. They criminally hide this fact by publishing incorrect data sheets or submitting high-quality samples for the initial evaluation and inferior materials to the jobsite. These forged materials can rightly be called fake products, since they do not offer the performance the contractor and the end-user expects. The using of theses fake products leads to damages in the new or newly renovated buildings and immediate repair is often necessary. Maintenance cycles have to be shortened since the products do not last as long as expected. So, the initial savings when buying those materials are immediately burnt up by increased installation and repair cost. The bill has to be paid by the owner or tenant of the property. Drymix mortar manufacturers applying for the MEDMA SEAL OF QUALITY have to prove proper production processes, quality control systems and the performance a particular drymix mortar product (such as a Render or a Tile Adhesive) according to the Industry Specification of MEDMA. They will be then issued with the MEDMA SEAL OF QUALITY and have to undergo a frequent bi-annual verification and renewal procedure. 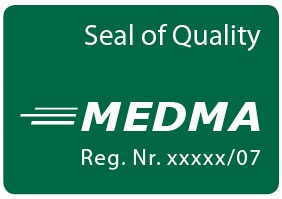 The MEDMA SEAL OF QUALITY will give developers and consultants a clear orientation when choosing drymix mortar products. It can be used as a proof of quality in the sales process of a flat or building towards the final buyer. The principles of the MEDMA SEAL OF QUALITY will be presented on the 2nd Annual MEDMA Drymix Mortar Conference in Dubai on 26 November of this year.